Unfortunately, ancient artefacts, especially when under international protection, do not mix with modern traffic. Cordoba’s old town was picturesque all right but a nightmare to drive around. It defeated even our faithful Sat-Nav Jane, whose instructions to “turn left after 400yd” came to naught when a left turn, or indeed any turn, failed to materialise. It didn’t help that we could see our objective, the Hotel Macia Alfaros, down a side street with no clue how to reach it. We eventually worked it out using one of the golden rules of travel – go back to the river (there’s always a river, in this case the Guadalquivir), re-orientate yourself, and start again. The hotel had an underground car park; we dumped the vehicle there and did not use it again during our stay. Macia Alfaros is a comfortable mid-level property in the Andalusian style, which basically means built round a courtyard and painted in gold and white. Rooms have a Moorish theme, there is free wi-fi, flat-screen TV, minibar and room service. 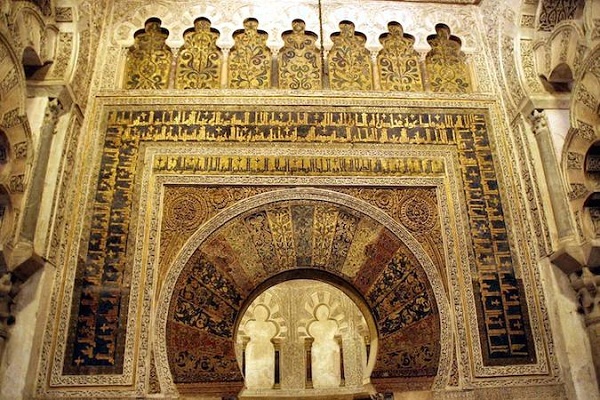 Adding insult to the injury of our attempts to find it, it also turned out to be just a 3min walk from Cordoba’s renowned Roman temple and only 12min from the Mosque-Cathedral, La Mezquita, which in turn adjoins the Jewish Quarter with its tiny synagogue built in 1315. If that building is small, La Mezquita makes up for it, an immense complex dating from 784 AD following the Moorish conquest of Spain. Set in an orange-tree garden, the mosque has a multi-columned prayer hall and priceless mosaics that continue to draw visitors from around the world. Its USP, or unique selling point, if it needs one, is the fact it was converted to a Roman Catholic church after Christian armies won back Spain in what is known as the Reconquest. The end result was the insertion inside the mosque in the 16th century of a Renaissance cathedral nave, leaving a confusing hotch-potch of styles but a monument to religion like no other and a World Heritage Site at that. If your interests lie further back in time, Cordoba was conquered by the Romans in 206BC and by the era of Julius Caesar had become an important provincial capital producing such great philosophers as Lucius Annaeus and Seneca the Younger, orators such as Seneca the Elder and poets such as Lucan. Remnants from this period include equally must-see sights such as the Roman Bridge and Temple, a theatre, mausoleum, the Colonial Forum and Forum Adiectum, an amphitheatre and the remains of the emperor Maximian’s palace at Cercadilla. As a busy tourist destination, modern Cordoba has much to offer too with a selection of hotels, restaurants and the well-known “patios” and courtyard cafés, where visitors can be surrounded by flowers adorning the walls while indulging in the local wines and authentic tapas. Popular hotels include Las Casas de La Juderia in the Jewish Quarter, NH Collection Amistad Cordoba, Eurostars Patios De Cordoba, Casa de los Azulejos and Hotel Eurostars Maimonides. The choice of restaurants is wide, the best-known including Amaltea, El Churrasco, Restaurant Choco and one that consistently tops the polls, La Regadera.